There are tons of articles on the issues of culture and alignment of values and goals and the issues around performance and innovation. 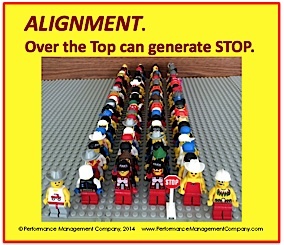 Alignment is good, but like being too detail-oriented, too much of the use of what should be a strength can be a liability when it comes to issues of creativity and innovation and staff doing Best Practices. While holding hands and walking single file is a good way to control a bunch of young schoolchildren on a field trip, that philosophy happening in the workplace is simply over-control.